NNPCN IS NOW HPCO ACCREDITED! It is with great pleasure that I come to you today, to share the good news. After a process of scrutiny which lasted a few months and required many hours of hard work from our NNPCN team, which involved Tamela Price-Fry as the Accreditation Officer, the NNPCN Board and the Office team, I am happy to announce that NNPCN received the Accreditation status from the HPCO, the most prestigious entity of Hospice Palliative Care in the Province, and will proudly wear the HPCO Accreditation Seal from now on! The HPCO Accreditation is the evidence that NNPCN meets the highest standards of quality as a Volunteer Visiting Hospice Palliative Care services providers. It is highly regarded by the NE LHIN, our funding and regulatory body, and arm of the MOHLTC (Ministry of Health and Long-Term Care) of Ontario. 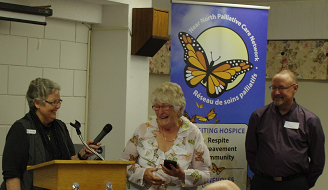 As small and humble as we are, a small Visiting Hospice in Northeastern Ontario, NNPCN name is now among the best and biggest Palliative Care organizations in the Province, who also wear the seal of HPCO Accreditation, due to their high-quality services and operations. This is a great achievement that was built by the personal high-quality work of each of you, our dedicated Volunteer, who has devoted to NNPCN along the years. I cannot thank you enough for your loyalty and commitment to NNPCN, and especially for your priceless kindness and self-giving generosity to the cause of Visiting Hospice Palliative Care to our community! I want to thank in special our Founder, Joan Burnett, and our Pioneer Volunteers, who laid down – with so many years of loyal solid work – the Foundation of this beautiful edifice that NNPCN is gradually transforming into! I have said this a few times and will say it again, I feel humbled and honoured to stand in the shoulder of giants like you, Joan and Pioneer Volunteers! Please receive my deepest gratitude and admiration, and my unwavering commitment to you, of keeping your Spirit alive at NNPCN, through challenges and accomplishments, and especially by following your steps of loyal and simple day-to-day hard work. After all, this is what builds up reality! I hope each of you enjoy deeply in your heart this great accomplishment, as your baby and fruit of your life of work! From today on, NNPCN wears the seal of Your high quality and commitment! This victory is yours, and this great accomplishment is fruit of your Volunteer Work. Congratulations, NNPCN Family! And thank you for being You! Hope your day is going well! Here wonderful news to you! Barclay House invites you to High Tea on March 20th, $5 per person. Jason Brock will play the Chapman Stick in the background, with tea, tea, and more tea! And little sandwiches and desserts to to go with it! And the best part: All the proceeds will go to the NNPCN!!! Spread the word!!! Let’s pack this place out!! As a result of collaboration between Heather McGuinty, Beth Hewson, myself and NNPCN Team, I am happy and proud to announce the launch of BEYOND THE OPEN DOOR – a Bereavement and Grief Interest Group for Professionals. Please find poster attached and share on to your professional groups. The goal of Beyond the Open Door is to provide a friendly space to local professionals actively working in the field of Grief and Bereavement. The format of the group is a continental breakfast for professionals. Please notice that this is not a training group, it is a networking and information-sharing group for Grief and Bereavement professionals. Monica Do Coutto Monni, B.A. Pol.Sci. M. Psych. Support your local Volunteer Visiting Hospice. Palliative Care and Bereavement Services free of charge. Donate with Credit Card or PayPal. Click on one of the links below. Hello NNPCN Friends! Please share on and participate! Thank you for supporting NNPCN, your Local Visiting Hospice for the last 30 years! During GivingTuesday, Near North Palliative Care Network will open our Adult Day Program to all socially isolated and lonely Seniors of our Community to come visit us or phone us. The Office Team is ready to give a warm welcome to you, in person or by phone, and have a warm moment of human contact with you! 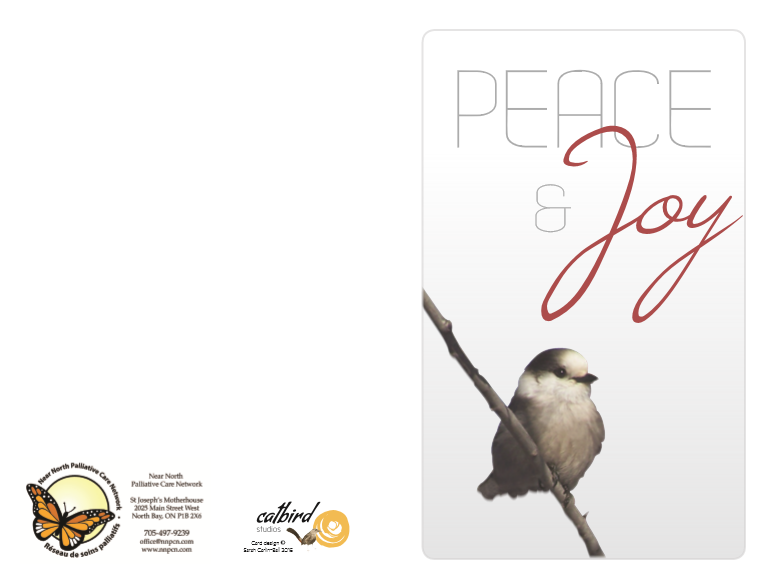 Thank you for you generosity and for choosing this meaningful gift in a Season of Giving! IT’S THAT TIME OF THE YEAR AGAIN! THE SPIRIT OF CHRISTMAS THON! It is a joy to come say a big THANK YOU to each of you present at the 30th Anniversary of Near North Palliative Care Network. If you could not be with us, here are the highlights of the celebration especially for you. We were honoured with the presence of our Founder, Joan Burnett, and starting by her, we celebrated our History, all Pioneer Volunteers, past Chairs and Directors of the Board, past Staff and Executive Directors, together with the young generation of Near North Palliative Care Network. We had the joy of welcoming 70 among our 100 active volunteers – that’s a massive turnout! We had dinner (truly delicious!) with ice cream and cake for dessert, then our AGM and Awards. Our wonderful volunteer Rose Joly fundraised over $250 by raffling a beautiful afghan made by her. We also raffled fabulous door prizes, such as 2 cruises with dinner for two at the Chief Commanda. Our Mattawa Team Lead Mary Lou Rainville happily hugging her new wonderful afghan made by Rose Joly. We ended the night with one of the finest artists of our community, Jason Brock, with the magic sound of the Chapman Stick ([email protected]). Thank you, Jason! On behalf of Near North Palliative Care Network, I want to express my gratitude, filled with emotion, for your overwhelming approval and massive support of our Volunteers, Board of Directors, friends and partners, expressed in the numbers of our Satisfaction Survey: you expressed almost 100% levels of maximum satisfaction with the AGM and with our performance this year. Please know that your support to the work of our awesome Office Team, Kristine Kellar, Kendra Thompson and Rebecca Grasser, to our new Volunteer Coordinator Alison Wilkes, and to myself as your new Executive Director, is decisive to the future of Near North Palliative Care Network. Believe me when I say that your support will be transformed in more services and benefits to you, our dear Volunteer, our Clients, Caregivers, and the aging members of our immense catchment area: Nipissing, Almaguin and East Parry Sound. Presented to Joan Burnett by Carol Barton-Bradley and Darren Renaud. Ontario Volunteer Service Awards, June Callwood Award. Darren Renaud announced that Lana Richardson was the recipient of the June Callwood Award at the 2017 HPCO Conference last April. Darren Renaud, Heather McGuinty, Monica Do Coutto Monni and the young generation of NNPCN celebrated pioneer Volunteers, past Chairs, past Executive Directors and past Staff, in the person of those present or mentioned during the ceremony. Darren Renaud and Heather McGuinty gave a special basket to NNPCN Founder Joan Burnett. Darren Renaud and Heather McGuinty said a few words in celebration of the pioneers. The young generation of NNPCN gave flowers and gift baskets to the pioneers. Pioneers who were present at the AGM gave one piece of advice or shared one lesson learned that they would like to pass on as their heritage to the future generations of Near North Palliative Care Network. The young generation of NNPCN shared one contribution they are giving or want to give to NNPCN. Joan Burnett, Nancy McCubbin (In Memory), Richard Paul, Donna Giroux, Nancy Lourie, Sally King, Antoinette Girard, Dianne Armatage, Lynn Duguay, Sister Marie Reynolds, Gail Rochon, Jo-Ann Labelle, Lauri Petz, Barb Spencer, Sandy Montreuil (Demille), Lana Richardson, Nathalie Leclair, Beverley Charron, Tamela Price-Fry and Andre Cotterall. Monica Do Coutto Monni recognized the great work done by several teams of Volunteers. June Kennedy (Team Lead), Estella Pelkey, Joan Watier, and Nicole McDowell. 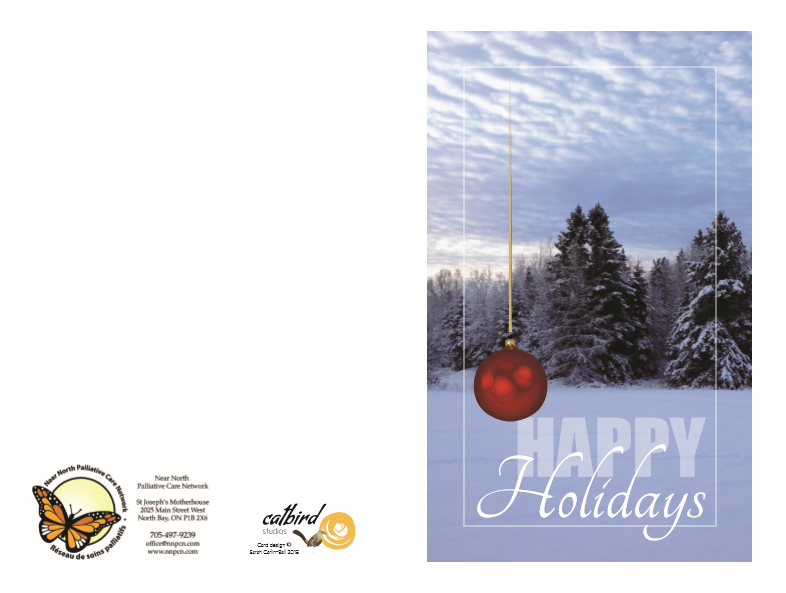 Tamela Price-Fry (Team Lead 2017) Harold Fry, Marie Loewen, Monica Do Coutto Monni and Wayne Duquette, Debbie Lee, Diane Lebrecque, Sheila Bailey, Oliva Ivic, Rose Joly and Michael Joly, Carol Owens, Debbie Sloss, Valerie Ann Sheekey, Jillian Robinson, Kendra Thompson, Kristine Kellar, Sara Kellar, Laura Fischer and Norm Fischer, Cathy Foisy and Jerome Foisy. North Bay: Kristine Kellar, Alison Wilkes, Cathie Foisy, Joanne St. Denis, Marie Loewen, Carol Fleming, Cecelia Seidler, Ann McKnight, Tamela Price-Fry, Jessie Lee Scherger, Dianne Armatage and Brenda Geden. Recently Trained/ In Training: Morris Chaput, Laura Fisher, Liette Girard, Ted Harrison, Beth Hewson, Jongbok Kim, Debbie Lee, Doreen Letourneau, Marcel Martin, Michael Millard, Joan Waiter, Maryanne Bartsch and Lucille Beaudry. Mattawa : June Kennedy, Sister Ginette Duguay and Linda Minor. Deborah Wuilleme, Crystal Dokis, Michelle Turcotte, and Rebecca Grasser. To Beverly Charron, our mentor, friend, and organizer of the AGM Award for years! Mark Brown, Jeffrey Brown, Elizabeth Chirico (BDO) and Jenny Leblond (CMHA). Sr. Josie McKechnie, St. Joseph’s Motherhouse new Administrator. For the constant kindness and attention of all resident Sisters of St. Joseph. Reception: Evelyn St. Pierre and Jackie Lacasse Sisters of St. Joseph. Maintenance: Robert Deschamps, Denis Lamarche, Bill Milne and Richard Burnfield. Housekeeping: Theresa Baril, Teresa Girard, Caroline Commanda, Jill Desbiens, Rejeanne Boissonneault, Lee-Erin Levesque, Claudette Martin, Priscilla McDonald, Theresa Raymond, and Lorraine Trezise. Dietary: Debbie Hummel-Murphy, Marie Belanger, Micheline Desrochers, Lori Ann Desrosiers, Charlene Devost, Tiffany Ramond, Andrea Murphy, Dolly Rogerson, Petrina Waboose, Sharon Webster, Maggie Yung, Jen Brush, and Monica Graveley. For his constant presence and support to the cause of Palliative Care in our region. Heather McGuinty and our colleagues and Case Managers at the CCAC-NE LHIN. Kate Fyfe, Ron Farrell, Terry Tilleczek, Lianne Valiquette, Megan Waque and Barry Lajeunesse. NNPCN is cautiously transitioning from small to medium-sized organization. Almaguin Palliative Care Team is preparing to a targeted Volunteer Recruitment campaign. Seniors Helping Seniors is now a mature project running for the second year completely free of charge to the seniors of our community. Next workshop happens on November 01. Butterfly Release 2017. We made $22,941.95 total, and a little under $16,000.00 (net), with investment in the new Butterfly Tree and Message Board for the years to come. External Committees. We represented NNPCN in several committees including the NE LHIN: local CSS, Nipissing Addiction and Mental Health System, Seniors at Risk, End of Life, Dementia Network of Nipissing (NTSAC), Nipissing Age Friendly, Housing and Homeless Network, Palliative Education Committee, Resident Hospice working group. Finances and Reporting. With the help of our new Treasurer Michael Lowe, Vice-Chair Bradford Halonen, our accountant Mark Brown, Elizabeth Chirico from BDO and Jenny Leblond from CMHA, and did all our Finances and Reporting to the NE LHIN and we are in very good shape. Palliative Care and Bereavement Services. We are growing in leaps and bounces with the help of our new Office Team: Alison Wilkes (Volunteer Coordinator), Kendra Thompson (Palliative Care Intern), Kristine Kellar (Bereavement and Day Program Intern), and Rebecca Grasser (Laurentian Placement). We developed: 1) the research of small isolated communities in our catchment area, to prepare for expansion. 2) our Bereavement sessions materials adapted to Francophone, First Nations and Visually impaired clients. 3) we launched the Day Program. Website and Social Media. Please visit our website often. We have 1975 Likes on our Facebook page and we give daily visibility to NNPCN. We bought a new calendar app for the website, that is more user friendly. Alliances and Partnerships. We established or renewed alliances with the following organizations: NBRHC, Cassellholme, Mattawa Hospital, Algonquin Nursing Home, Marina Point, Chartwell Barclay House, Canadian Careen College, Canadore College, Empire Living, Laurentian University and Waters Edge. Communication and Awareness. We have our new Day Planners with all internal events and workshops of NNPCN from October 2017 to March 2019 and a new Table Calendar 2018 to be given to you at our Year-End Potluck. We represented NNPCN in diverse events, such as the HPCO 2017 Conference, sponsored the webcast of BON 2017 Conference, Sunflower Festival Sundridge, Strong Fair Festival Sundridge and Silver Lining Exhibition North Bay. The Office counts now on seven new laptops and One Drive Office, which allows us to expand unlimitedly, with staff and key volunteer teams working remote from home. Hiring of Third Staff. Alison Wilkes is our new Volunteer Coordinator and Tamela Price-Fry is our Accreditation Officer. Bev Christie Froud our new Grants Officer is a Volunteer. Board Directors. We are looking for professionals in Events, Fundraising, Sales, Public Relations, Recruitment and Engagement, to join our working Board. Today we celebrate 30 years of existence. It has been a wonderful adventure! Little by little, with your constant work and support, Near North Palliative Care grew up from a small informal initiative, to a registered charity, and then to your Volunteer Visiting Hospice, funded and regulated by the Ministry of Health through the NE LHIN. Near North Palliative Care Network grew up on the rock of Kindness, and is standing on the shoulders of Giants: humble, loyal Giants. You are committed Volunteers devoted the cause of Palliative Care. You have worked hard, day in and day out, humbly and silently, without expecting anything in return. You made this happen. I think about 20 years from now, when Near North Palliative Care Network celebrates it’s 50th Anniversary. Many of us will not be here anymore, many of us starting their journey with NNPCN right now will be our future leadership. What will NNPCN be in our 50th Anniversary AGM? I hope that we will be a mature middle-sized organization, with a few hundreds of volunteers, different Departments – and far more than two Office staff – serving thousands of people in our immense catchment area. Between Past and Future, here we are, in this magical Bridge, the magical moment of Now – when Past and Future meet in the Present, to celebrate 30 years of self-giving generosity, of pure Goodness, gifted by you to our Community. In this magical Bridge called “the Present,” where we stand this evening, Past and Future are embracing, to renew their loyalty and commitment to Near North Palliative Care Network. I am sure that, like me, you are proud to tell your friends that you are a Near North Palliative Care Volunteer! That you believe in our organization and our mission! That you proudly wear the shirt of this organization! That we all need and want NNPCN vital services in our community. And that you made amazing Friends in this organization – the cream of the crop of our community! That you are united by bonds of mutual Trust, Respect and Admiration to your colleagues. That you, like me, promote and defend the good name, the interests and goals of Near North Palliative Care Network wherever you go, with loyalty. This is the mark of a great organization. Near North Palliative Care Network had a great start and Past, has a great Present, and will have a great Future, because it has great Volunteers united in love. Thank You, dear Volunteers, for all that you are and for all that you do! Thank You! EXCELLENT: 91.19% of maximum satisfaction with AGM 2017, the Organization and the current Administration. GREAT: 8.15% of great satisfaction with AGM 2017, the Organization and the current Administration. GOOD: 0.67% of satisfaction with AGM 2017, the Organization and the current Administration. Please know that your support to the work of our awesome Office Team, Kristine Kellar, Kendra Thompson and Rebecca Grasser, to our new Volunteer Coordinator Alison Wilkes, and to myself as your new Executive Director, as we complete the first year of my Administration, is and will be transformed in more services and benefits to you, our dear Volunteer, our Clients, Caregivers, and the aging members of our immense catchment area: Nipissing, Almaguin and East Parry Sound. We are not sparing any efforts to gradually build solid Trust with the community and our partners, based on the foundation of professionalism, true commitment, ethics, transparency, accountability and structured hard work based on best managerial practices. Your high levels of of satisfaction encourage us to keep going the extra mile for our organization, day in and day out! CHECK OUT THE PHOTOS OF THE LAUNCH OF NNPCN ALMAGUIN! SUNDAY MAY, 28TH, 2017, CASWELL RESORT. PAINT OUR TOE NAILS ORANGE! PAINT OUR TOE NAILS ORANGE! In support of the launch of Near North Palliative Care Network in Almaguin Region, Sundridge Mayor Lyle Hall and NNPCN Board Director and Almaguin Lead Fraser Williamson will have their toe nails painted orange if a total of $3,000 is raised! TO DONATE: there will be a donation Jar at L’egance Day Spa (Behind Foodland in Sundridge), or you can mail cheques to Near North Palliative Care Network PO Box 656 Sundridge P0A 1Z0. THANK YOU, Mayor Lyle Hall and City Council of the Village of Sundridge, for the massive support to the cause of palliative care in our community! 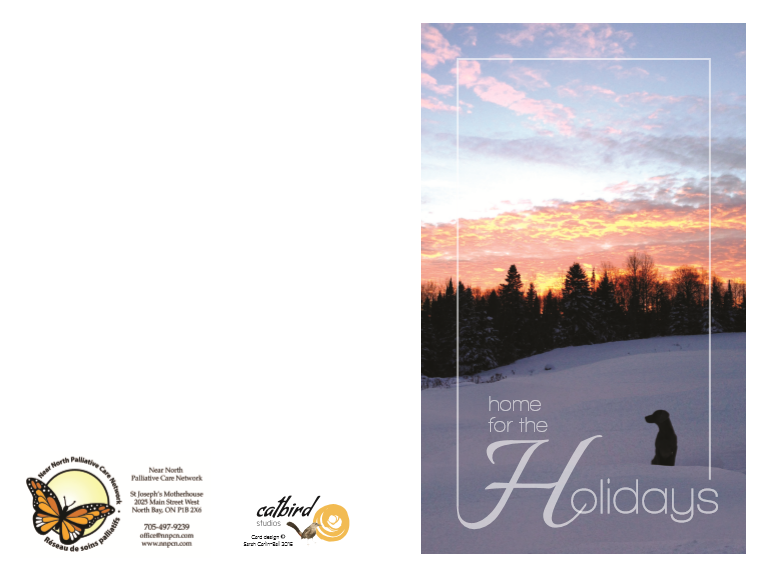 Near North Palliative Care Network, your Community Hospice in Nipissing and East Parry Sound Districts since 1987! Near North Palliative Care Network (Nipissing/Parry Sound) and OTN Ontario Telemedicine Network. 5th ANNUAL FAMILY MUSIC NIGHT, MATTAWA. The highest bidders will be contacted to provide payment and to pick up their items. For more information or to donate, please contact. Thank you to all our donors and bidders for your generous contributions and ongoing support. Merci à tous donateurs et les soumissionnaires pour leurs contributions généreuses et leur soutien. La fermeture de l’encan: le 2 juin à 15h Les gagnants seront avisés par téléphone. The Near North Palliative Care Network (NNPCN) is holding its sixth annual Music Night Fundraiser for 7 pm – Friday May 05, 2017 at St. Peter the Apostle Church, 299 Airport Rd, North Bay, ON P1B 8W7. Among musical attractions and performers, you will enjoy Rob and Donna Lee Guillemette, Music City Ukulele Club, North Bay Baytones, PADDLE Program, Tom Arens Trio, Jason Brock and more! Part of the evening includes a Silent Auction. Building on the inaugural success of this event, we continue to make each subsequent event better than ever. We value the support of the community and ask you to consider a donation to the silent auction table or with your presence at the event. Near North Palliative Care Network (Nipissing-Parry Sound) is our Community Hospice in North Bay since 1987. We provide compassionate support for the terminally ill person and their families. Our volunteers play a special role in helping individuals and their families through the dying process. We provide information, companionship, deep listening, and healing in the face of a terminal illness. We also provide grief and bereavement support. Trained volunteers are available on a 24-hour basis. We are a recognized charity and our service is provided at no cost to the client or family. Fundraisers such as the Music Night and our annual Butterfly Release at the North Bay waterfront on July 15th, 2017, are critical to sustaining service provision. This is especially true in the coming years as there is more and more demand for our services. 2 full time positions 1-year contract each at $31.000/year for two recently graduate students. Job Titles: Project Development Intern and Outreach Development Intern. Eligibility: diploma or degree in one of the following, but not limited to Computer Sciences, Business Administration, Law, Psychology, Social Work, Public Health, Public Administration, Education. Valid drivers’ licence. Bilingual an asset. TO APPLY: Email Resume and Cover Letter to [email protected] DEADLINE April 1st. Photo: Near North Palliative Care Network at Nipissing University Student Union Career Fair, March 14. Due to the weather conditions, we are cancelling all activities for today, March 01st, at the Motherhouse. SENIORS HELPING SENIORS SESSION 5. 1 pm Advanced Illness: Holding On and Letting Go. CANCELLED. RESCHEDULED FOR EARLY JUNE. GRIEF GROUP SESSION 1 PM. CANCELLED. The group meets again next Wednesday, March 08, 1 PM. DEATH CAFE. 7 PM. CANCELLED. New date to be announced soon. We apologize for the inconvenience and will be in touch with you to announce the new dates. Many thanks for your understanding and patience and wishing you a peaceful day. Stay safe! This is an internal event for our dedicated and compassionate Volunteers! “SENIORS HELPING SENIORS” NNPCN PROJECT TO BE LAUNCHED IN AUGUST! Near North Palliative Care Network, YOUR LOCAL VISITING HOSPICE FOR THE LAST 28 YEARS, will be launching their new Public Services Project “SENIORS HELPING SENIORS” this August 2016. A series of free monthly training sessions for Seniors and Caregivers will be happening at St. Joseph’s Motherhouse from September 2016 on. The idea behind the project “SENIORS HELPING SENIORS” is to empower the community with free education and training about End of Life. All Seniors and Caregivers of our community are invited to participate and there is no charge. Dates and themes of the series to be announced soon! STAY TUNED! NEAR NORTH PALLIATIVE CARE NETWORK: YOUR LOCAL VISITING HOSPICE FOR THE LAST 28 YEARS! 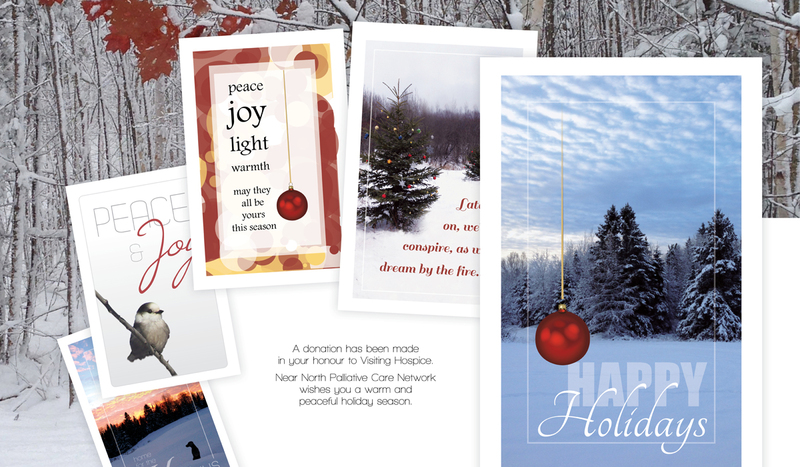 Please remember NNPCN between your Hydro and telephone bills, and SUPPORT YOUR LOCAL VISITING HOSPICE ALL YEAR THROUGH! YOUR DONATION MAKES FREE PALLIATIVE CARE VISITING HOSPICE AND BEREAVEMENT SUPPORT SERVICES HAPPEN IN OUR COMMUNITY! National Volunteer Week April 10-16, 2016! Speak Up! April 16, 2016 is Advance Care Planning Day. To learn more about Advance Care Planning click here Speak Up! Please find attached the poster for the annual Walk for Alzheimer’s. You can share this poster with friends, get a team together or come join us on your own to walk. Whatever you choose, we would be happy to see you! If you can’t join us, you may sponsor me by going to www.walkforalzheimers.ca , select North Bay walk, click on Participant Information then to the left, click on sponsor a walker. In participant name, you would put in Linda Brown and proceed to make your donation. We thank you for all your support and every dollar raised will stay in our community and support the local programs and services. Help us remember those who can’t! ALS is a neurodegenerative disease where the nerve cells that control your muscles die. The ‘living wires’ which connect your brain to your muscles degenerate, leading to a loss of mobility, loss of speech and eventually impact the ability to breathe. Priority Assistance to Transition Home (PATH) Program: The Canadian Red Cross, PATH program may assist you in accessing Community Support Services. Check the PDF’s below for more information. Check out who are our awesome Volunteers, Donors and Staff. We are there for you when you need it the most. Our donors make it sure that we are there for you when you need us.